Market closed permanently on March 11, 2016. 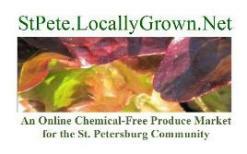 StPete.LocallyGrown.net is an online produce Market connecting Tampa Bay Area consumers with St. Petersburg’s growers of chemical-free produce and products. We do not sell conventionally grown produce, period. This Market was founded in January 2011 by the Levy’s when they saw a need to expand on the variety of locally grown, chemical-free veggies growing in their backyard. Their friends and neighbors created the demand for this business and every two weeks the demand continues to build as more and more people walk away from chemicals in their diet. We are helping to recreate a small town farming community in St. Petersburg. We have organized local urban farmers (growing chemical-free in their backyards) to get excess produce to market for those who either choose not to grow—or who cannot grow— their own food. Our collective volume of produce strengthens our individual selling power and creates a convenient, one-stop-shopping variety for local residents. We work hard to provide ways to educate our customers on how to grow their own food and how to prepare vegetables that are new to their household menu. We provide monthly educational lectures that encourage and support a healthy lifestyle. We strive to balance our customers’ needs with our need for a prudent business model. As we evolve, we count on our loyal customers’ feedback to help us improve, with the understanding that we (The Market) will not always be able to please everyone. But we will try! We want your business for the long-term. Open an account in The Market section. The online Market is open Monday 3pm through Wednesday 8am every other week from NOVEMBER THRU JUNE. Our customers place orders choosing one of two payment methods: 1) pay by credit card online when they order or 2) by cash or check when we deliver on Friday. All deliveries take place on Friday to homes, offices, or neighborhood co-op pickup spots. Delivery fees are minimal. With few exceptions, customers can leave us a check and a cooler if they cannot meet us for delivery. Details on how to order, explanation of associated market fees, list of delivery spots, and guidelines for maintaining the high quality of customer purchases can be found on our Q&A page including a tutorial on using our online Market. Conventionally grown produce at the local grocery store is pretty to look at. The tomatoes are perfectly round and red. All the greens are clean and sprayed with water around the clock. The carrots are crisp and impressively long and straight. But if you look deeper, it’s not so pretty: The tomatoes are gassed when they’re green to turn red so they will last longer. The greens were grown with chemical fertilizers and pesticides. The carrots are covered with an invisible petroleum-based membrane that keeps them crisp for months. We only sell organically grown, chemical-free vegetables and they are fresher than both conventional AND organic produce sold in local stores. Since they are grown locally—much of it within the city of St. Petersburg— most of our vegetables are harvested to order within 24 hours of delivery. You are decreasing your carbon footprint by buying locally grown produce, lessening the need to transport vegetables in from other parts of the state or country. Most importantly, you are contributing healthier food to your most sacred environment, your body! Our standards are high and we want to provide the best locally grown, chemical-free vegetables you can buy. Our Market vegetables may not always be as pretty or as large as conventionally fertilized vegetables. You may have to let that tomato sit on the window sill a day or two to fully ripen. Cauliflower heads are usually smaller than conventionally grown but so much sweeter! A couple of wonky carrots in your batch should add character to the bunch. We hope you embrace these quirks as signs of authenticity. Our vegetables are grown in local gardens and backyards. They are not hit with chemicals. They are not engineered or covered in oil. And many of our growers do not extensively clean their vegetables because getting them wet speeds spoilage. Become a customer and support our Mission—and the local economy— with your dollars. For maximum health benefits, eat local & buy what’s in season. Contribute to our Market Community Food Blog with recipes for your creations from produce purchased from our Market’s urban farmers. Attend our monthly potluck socials. Learn to grow your own food. Help us find urban farmers to join our Market’s Growers. We know you are out there and we have resources to help you get started. No garden is too small for this effort and there is no longer any excuse for not starting your own chemical-free garden to earn extra dollars in this challenging economy. Help us by having high expectations from your delivered order. If any product you buy is not up to your standards, we want to know asap. We will gladly refund your money or give you credit to choose something else. That said, we do request that you inspect your delivery once you receive your order. As you might imagine, it is difficult for us to compare our pricing with that of local retailers because our produces cannot be equitably compared. Our chemical-free, locally grown produce is usually harvested within 12 to 24 hours of delivery compared to (so much of it) that which is trucked in and stored before a customer can examine and purchase. What price can you assign to “truly fresh” and still keep it affordable? Even though we are chemical-free and not certified organic in all cases, our produce is fresher than most USDA produce sold by local retailers. Our pricing reflects our philosophy that healthy fresh chemical-free produce has to be affordable for the general population. Every day, we strive to meet this challenge. We highly recommend that you review the Q & A’s section where you will learn quickly how we operate and what to expect.